Up to 1008TB per 4U box. With an affordable price, the best petabyte solution. Hardware Accelerated RAID-0, 1, 5, 6, 10, 50, 60 with support for hot spares. 72 x 3.5" SSD, SAS and SATA drives, mixable. Support for iSCSI, NFS, SMB, NAS, which can be mixed. 4 to 24 x Gigabit, or mix with 10Gbit, Fibre Channel Host, Infiniband. One or two Intel Xeon Multi-Core processors; up to 1TB system memory. Linux, Solaris, FreeBSD or Windows OS, supports Windows, Mac and Linux Clients. Redundant Power Supply. (2+1), KVM over IP supported. 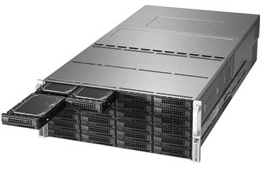 PolyStor 4U96A offers a high performance, incredible storage capacity in an 4U box, at a very affordable price. This is one of the best intelligent network storage solution for data centers, enterprise archiving, or cloud storage. Optional: ZFS, NTFS, or any file system supported by the x86 platform. Intel, the Intel logo, Xeon are trademarks of Intel Corporation. All others are trademarks of their respective companies.